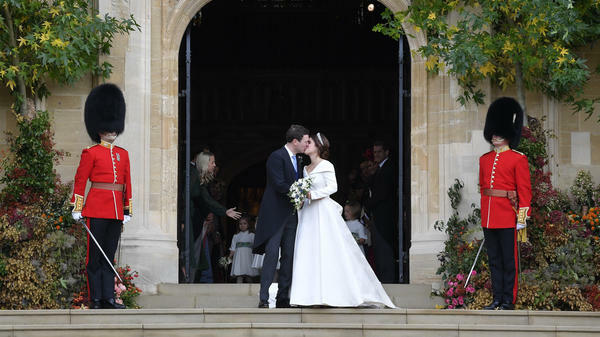 Princess Eugenie of York and Jack Brooksbank kiss after their wedding Friday in St. George's Chapel at Windsor Castle in England. The royal wedding between Eugenie and Brooksbank was simultaneously a smaller-scale yet still-high-wattage affair compared with her cousin Prince Harry's nuptials in May. 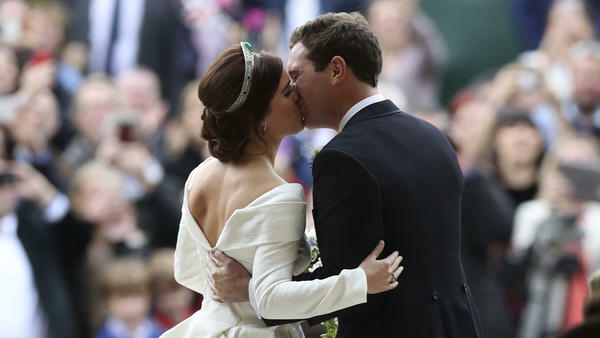 Princess Eugenie of York, granddaughter of Queen Elizabeth II, walked down the aisle Friday to wed Jack Brooksbank. The royal wedding comes nearly five months after the nuptials of Prince Harry and American actress Meghan Markle drew more than 100,000 spectators to Windsor (and about 50 million viewers in the United States and Britain). For all the pomp, circumstance and media hype of British royal weddings, the ceremony for Eugenie and Brooksbank was simultaneously a smaller-scale yet still-high-wattage affair. Guests included American actresses Demi Moore and Liv Tyler and models such as Kate Moss, Naomi Campbell and Cara Delevingne. The bride, 28, stunned in a low-backed gown by British-based designer Peter Pilotto and Christopher De Vos — cut to show the scar from scoliosis surgery she had as a child — and a diamond-and-emerald tiara loaned by the queen. The groom, 32, told her, "You look perfect." In the runup to #royalwedding2, one challenge appeared to be achieving royal grandeur without being outright ostentatious. Eugenie is ninth in line to the throne and a princess born with the title Her Royal Highness. Yet Eugenie is also considered a "minor" royal — meaning that she supports charitable causes and appears at some crown functions but does not carry out royal duties full time, as her uncle Prince Charles and cousin Prince William do. Eugenie does not receive a government salary or full-time security. Eugenie, who graduated from Newcastle University in 2012, works at an art gallery. She and Brooksbank, a drinks executive, say they fell in "love at first sight" in 2010. Five-year-old Prince George, son of Prince William and Kate Middleton, served as page boy during the wedding, and 3-year-old Princess Charlotte was one of the bridesmaids. When it emerged that security costs to taxpayers were estimated to exceed $2.5 million, debate ensued over public funding for the wedding of private individuals. (Security costs for Harry and Meghan's wedding were estimated at $2.6 million to $5.3 million.) An online petition by the anti-monarchy group Republic urging the government to withhold taxpayer funding for the wedding has attracted more than 47,000 signatures. It was not clear shortly before the wedding how much spectacle the ceremony would generate. At the rehearsal Thursday, the number of onlookers rivaled the number of photographers staking out the Windsor Castle gate — less than a dozen of each. Shortly before the couple drove past, one Brit walking by joked, "Second royal wedding? Nobody told me!" A BBC report this week speculated that this medieval town is "royal weddinged out," and the sidewalks in Windsor were noticeably empty the night before the ceremony. The two married at St. George's Chapel. The 15th-century Gothic-style church has been the site of numerous royal weddings since Queen Victoria's reign and is considered a lower-key venue for such affairs: It holds fewer than half the nearly 2,000 guests that can be accommodated at higher-profile London locations such as Westminster Abbey (where the bride's parents married in 1986) or St. Paul's Cathedral (where Prince Charles married Lady Diana Spencer in 1981). Eugenie and Jack invited 800-plus guests, about 200 more than attended Harry and Meghan's ceremony. In addition to the afternoon reception hosted by the queen at Windsor Castle, the couple reportedly have planned an evening reception as well as a festival-like party Saturday at Prince Andrew's home Royal Lodge — complete with food stalls and games. Harry and Meghan might have drawn bigger crowds, but the smaller turnout for Eugenie and Jack had its upsides — including unobstructed views of the couple. "I thought there would be lots of people arriving, but there aren't. I've been waiting and waiting," Lincolnshire resident Kerry Evans, 54, told the Daily Mail. "I wanted to be part of the wedding and the traditions because it's all part of being being British." Journalist Autumn Brewington reported from Windsor, England.